The Divine Sister is the latest in a long line of comedies by Charles Busch that chew up the most familiar conventions of some stage/screen genre and reconstitute them as campy burlesques. Having had his way with science fiction (Vampire Lesbians of Sodom), surf movies (Psycho Beach Party), and horror films (Die Mommie Die! ), among others, now he’s trained his sights on nun stories. You might have thought the Nunsense franchise had exhausted that market already. But instead of playing to the nostalgic nightmares of Catholic-school survivors, Busch (a nice/naughty Jewish boy from Chicago) is more interested in mashing up celluloid depictions of the brides of Jesus. And he doesn’t stint on the bawdy humor. 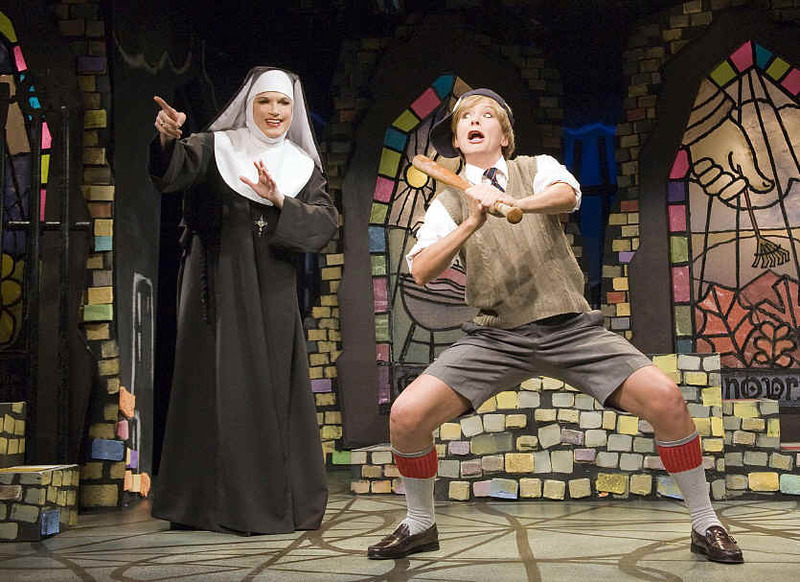 The play sprinkles in snatches from all the obvious sources, from The Flying Nun to Agnes of God to Doubt, with a little Da Vinci Code thrown in for good measure. It’s 1966, and St. Veronica’s School in Pittsburgh has seen better days. Its facilities have fallen into disrepair, and attendance is waning. “We live in a time of great social change,” declares the Mother Superior, “and we must do whatever we can to stop it!” Never mind that the Mother Superior is played by Busch (looking remarkably like Liza Minnelli in a wimple), arrives on bicycle, and sings folkie duets with a postulant who has discovered a saint’s face on the urine-stained underpants of a schoolboy. She is determined to hang on to tradition by her painted fingernails (she’s written a book called The Middle Ages: So Bad? ), even if it means going begging for donations from all the Jewish philanthropists in town with her sidekick, Sister Acacius, the school’s wrestling coach (played by longtime Busch trouper Julie Halston). A mini-series’ worth of plot gets crammed into an intermissionless 90 minutes: flashbacks to the nuns’ former careers as girl reporters, amazing coincidences of abandoned orphans being reunited with their birth mothers, and a sinister subplot involving a visiting nun with a German accent who is not what she seems (played by musical theater semi-star Alison Fraser, who manages to make the word “illuminating” sound positively lascivious). Busch’s style of playwriting evolved from doing shows at East Village nightclubs in the early ‘80s, where he and his ensemble learned to manage drunken audiences and tiny attention spans with quick changes, short scenes, and humor that can never stoop too low. The Divine Sister makes a running joke out of a notorious line from The Sound of Music—“What is it, Maria, you can’t face?” – which, with a single Teutonically-pronounced vowel, becomes an obscene epithet. None of the cast members will be winning any awards for the subtlety of their performances. Some of their mugging is so extreme, it’s a wonder they don’t sprain their faces. But they’re clearly having a ball clowning around onstage. And the cartoonish production design has its own touches of wit. I especially liked the saggy-bosomed uniform Fraser wears as the charwoman Mrs. Macduffie (Fabio Tobtini designed the costumes). And the stained-glass windows that set designer B.T. Whitehill dreamed up for St. Veronica’s depict Bible stories I’d never encountered before: Jesus barbecuing hot dogs! Jesus building a snowman! Needless to say, you won’t be seeing The Divine Sister at any vacation Bible school drama festivals.